Creating a chess set and board can be an interesting and valuable experience for the woodworker who is learning to use a bandsaw or lathe. There are free plans for chess boards and pieces that are unique gift ideas or a great addition to your game room. Build a chess board that contains a drawer to hold chessmen and checkers. Any chess player would be proud to own this beautiful piece. It would make a stunning Christmas or Father's Day gift. Create an oversize chess set, using a lathe to turn the chessmen. Use contrasting woods to create the two armies, or use contrasting paints for a bold and contemporary look. Hand crafted chess sets are popular for gift shops or craft shows. 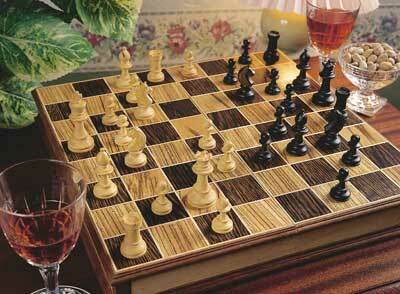 Individual chess boards are also good selling items. Exotic hardwoods can make these boards a unique gift that will long be remembered. Build a fun project for games designed to sit on a table with a storage area for all the chess pieces.